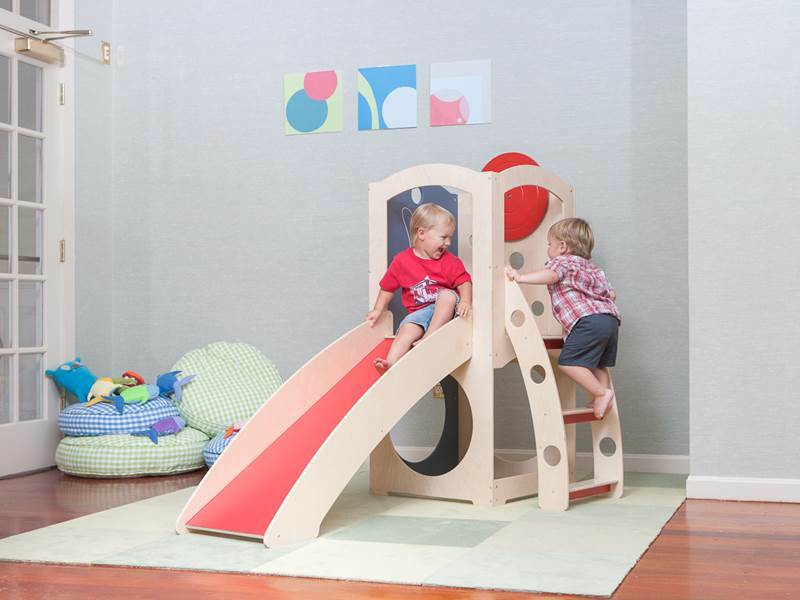 In the fall of 2009, CedarWorks released their innovative Rhapsody Indoor Play product line and we totally fell in love with the out of this world designs and fun these structures offered kids.This autumn, CedarWorks has something new and more compact to offer families: the Rhapsody Solo. The Solo line consists of two space-efficient, yet playful structures that are pre-designed with some of CedarWork's most popular indoor playset accessories, ensuring hours of awesome indoor playtime when it's too wet or chilly to send the kiddos outside. Keep reading to learn more. “We all love to play outside, but weather, shorter daylight hours and our busy schedules means there are only so many days a year and hours a day that we can make that happen. Having four kids of my own, I knew we had to find a way to bring CedarWorks’ outdoor playsets inside,” stated Barrett Brown, CedarWorks company President. Brown goes on to note, “The entire Rhapsody Indoor Play line has grown from this simple idea and we are now pleased to introduce Rhapsody Solo. Solo packs our most popular indoor playset accessories into an economical footprint and price point.” With this in mind, Solo structures pack a playtime punch. 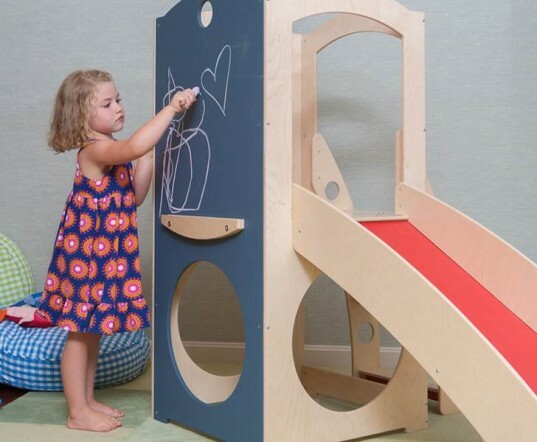 From a cozy nook hideout to a double-sided chalk board to a fun steering wheel and even a slide, there’s enough fun in one Solo structure to keep your little one active and busy for hours. Beyond exquisite design and fine craftsmanship, CedarWorks really pays attention to the materials they use. Like all Rhapsody Indoor Play products, Solo is made from high quality Baltic Birch — which means premium solid wood construction that’s safe, durable and long-lasting with absolutely zero plastic parts. All playset finishes are environmentally friendly as well, including the colored components of Rhapsody products, which are entirely finished with stains that perform well below state and federal VOC emissions regulations. Due to solid wood construction, each Solo structure is durable enough to withstand even the roughest play from the most active kids. On top of this, CedarWorks focuses on safety. Each playset they make is designed to accommodate the weight of an adult, which means kids will be safe and secure on their playset, which won’t fall or break apart. Wood pieces are sanded super smooth and edges are rounded smooth so little hands don’t get scratched. Solo comes in two pre-designed playful options, Natural and Color and comes in a small size to fit virtually any home, even one with very little excess space. All CedarWorks structures are affordable, especially once you consider the sustainability and longevity of these products. You can also customize any CedarWorks structure thanks to an easy to work with in-house design team. You can see prices, chat with the company and learn more about products with just a quick preferred customer sign-up at the CedarWorks website. “We all love to play outside, but weather, shorter daylight hours and our busy schedules means there are only so many days a year and hours a day that we can make that happen. Having four kids of my own, I knew we had to find a way to bring CedarWorks’ outdoor playsets inside,” stated Barrett Brown, CedarWorks company President. Brown goes on to note, “The entire Rhapsody Indoor Play line has grown from this simple idea and we are now pleased to introduce Rhapsody Solo. Solo packs our most popular indoor playset accessories into an economical footprint and price point.” With this in mind, Solo structures pack a playtime punch. 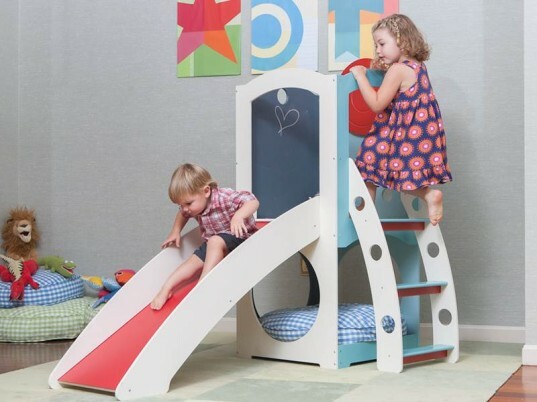 From a cozy nook hideout to a double-sided chalk board to a fun steering wheel and even a slide, there's enough fun in one Solo structure to keep your little one active and busy for hours. Beyond exquisite design and fine craftsmanship, CedarWorks really pays attention to the materials they use. Like all Rhapsody Indoor Play products, Solo is made from high quality Baltic Birch, which means premium solid wood construction that's safe, durable and long-lasting with absolutely zero plastic parts. All playset finishes are environmentally friendly as well, including the colored components of Rhapsody products, which are entirely finished with stains that perform well below state and federal VOC emissions regulations. Due to solid wood construction, each Solo structure is durable enough to withstand even the roughest play from the most active kids. On top of this, CedarWorks focues on safety. Each playset they make is designed to accommodate an adult's weight, which means kids will be safe and secure on their playset, without it falling or breaking apart. Wood pieces are sanded super smooth and edges are rounded smooth so little hands don't get scratched. Solo comes in two pre-designed playful options, Natural and Color and comes in a small size to fit virtually any home, even one with very little excess space. All CedarWorks structures are affordable, especially once you consider the safety and longevity of these products. You can also customize any CedarWorks structures thanks to an easy to work with in-house design team. You can see prices, chat with the company and learn more about products with just a quick preferred customer sign-up at the CedarWorks website.